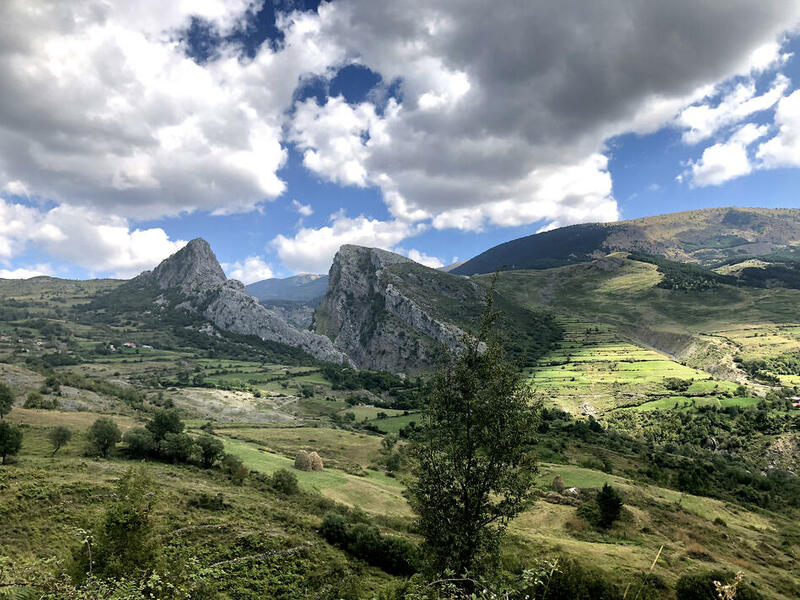 We traveled south to picturesque Gramsh and high up into the southern Dineric Alps, which span the length of the country, taking in westward views into the fertile valleys sweeping towards the Adriatic and Ionian Seas. This dramatic landscape contains a variety of microclimates in which a diverse array of precious plants can grow with seasonal availability. An average of 260 sunny days per year provides the ideal climate for aromatic crops such as thyme, pennyroyal, and raspberry leaf, as well as high alpine natives such as arnica, valerian, and gentian. The terrain is unspoiled and rich, the air and water clear, and the people have homesteaded here in these rich lands for hundreds of years. A sweeping view from Shkembi i Kopacit (Kopaci Cliff) of the rugged, glacier-carved terrain of the Dinaric Alps, a region tended by Albania's farmers for hundreds of years. Throughout these pristine mountaintops grow some of the world's finest botanicals, raised on air and water of nearly unparalleled natural purity. The small pockets of communities residing in these mountains have traditionally relied on wild botanicals for their economy and typically live very simple, agrarian lives. Up in these mountains, people have created beautifully constructed homes with stone and wood gathered from the very land on which these structures are built, and the plants and animals they rely on daily to survive are also housed or cultivated within a few minutes’ walk of their front doors. We observe shepherds out roaming with their flocks, often stopping to collect desirable herbs along the way. We were lucky enough to run with a pack of true Anatolian shepherd dogs cruising the dramatic landscapes. It is a lifestyle from another era, where horses are the main mode of transportation and goods are carried with hand-built carts. And while we find it impossible not to lose ourselves in these tranquil and bucolic scenes, we are also aware of the decidedly non-idyllic historical events that led to a culture being effectively frozen in time. United Plant Savers' Executive Director, Susan Leopold, pauses before a traditional farmstead along a country road used by locals to transport herb harvests down from the mountains to the area's consolidation sites. Most structures in these rural villages have been hand-built and rebuilt from resources found in the surrounding area, often maintained by the same families for generations. Albania’s long history of communism, which governed the country from 1941 to 1991, restricted free trade and occupation options, leaving many inhabitants of these rural areas to rely on homesteading to survive. The long and oppressive reign in a way preserved this way of life, since living off the land up in the mountains became even more necessary as cities and towns were emptied of opportunities and resources. 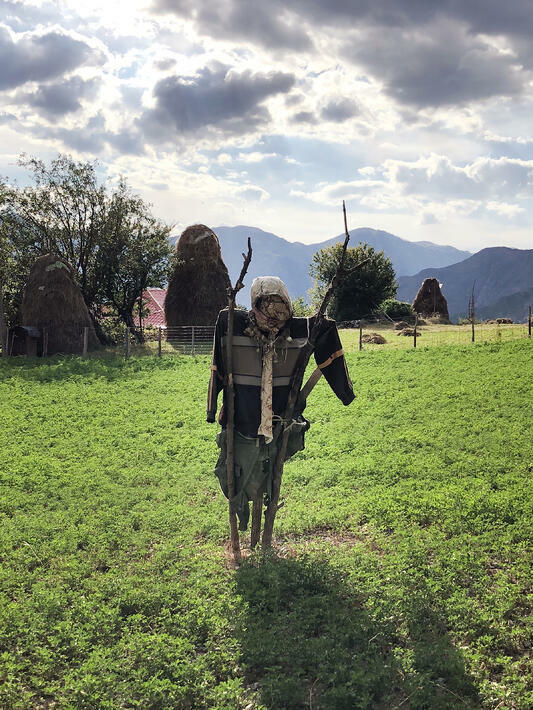 During this difficult time in the country’s history, the tradition of wild-harvesting was kept alive by collectors like Misir, who we meet upon our arrival in the village. Misir has lived in these mountains his whole life and comes from a group of wildcrafters who specialize in gathering rosehips and juniper berries in the autumn months. 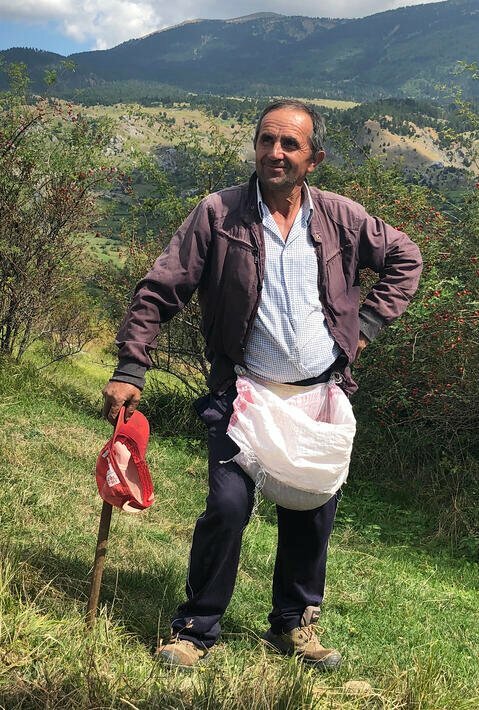 As he takes us into the mountains where he collects his berries for hours each day during collection season, he remarks that he could make more money doing other things, now that the political climate has improved, but that this is the way of life he prefers. For Misir, at least, catching up with the modern world seems a race not worth running, even when the government no longer prevents them from doing so. 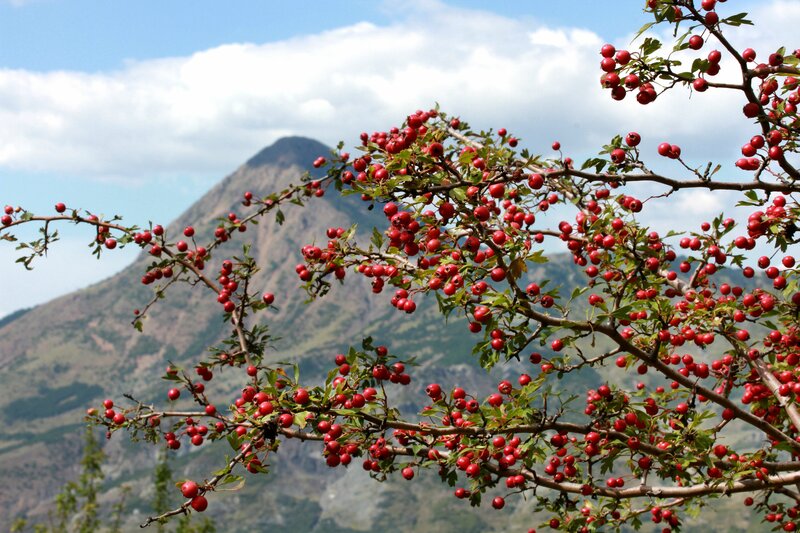 The annual rosehip, juniper berry, and hawthorn berry harvest is well underway in these pristine mountains as we stop to chat with Misir, who has long made his living hand-collecting herbs for botanical trade. For others, the return of commerce to city centers has provided new economic opportunities, even for those who continue to live remotely and simply most of the time. In the center of this lush valley region, in an area still inaccessible by road, stands a completely hand-built village of the Romani people called Grabova. This self-sustaining community of 400 is completely self-governed. Our guide, Alban, is the buyer for these pickers. He explains that his father was once a prominent collector up in these mountains, so he grew up learning the trade, gathering berries, roots, and flowers. He eventually learned the business side of things as well, and he now represents the collectors by consolidating and transporting their harvest to the city and negotiating for the best price. The nation’s plant bounty includes a wide range of apothecary and culinary favorites. Crafters of herbal remedies have long sought out its elderberries (Sambucus nigra), rosehips, hawthorn berries, juniper berries, and gentian. It also hosts many of Mediterranean cuisine’s most essential ingredients, including thyme, mint, oregano, marjoram, savory, and tarragon—not to mention the famous wild Dalmatian sage, Salvia officinalis. This aromatic native was once abundant in the northern and the southern areas of the country along sea crests and rocky, low-elevation terrain. Its silver-green leaves are valued as a spicy culinary worldwide, and much of the supply comes from the rugged cliffs along the coast of the Adriatic Sea. 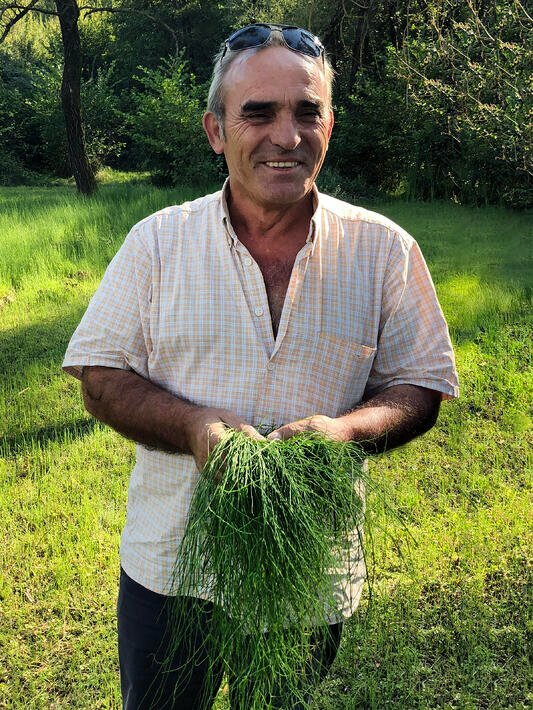 In fact, while at one time virtually all of Albania’s commercial botanicals were wild collected, the entire industry is now undergoing a slow but apparently steady shift from wild-harvesting to dedicated botanical cultivation on farmland. This transition will likely become all the more pronounced (and necessary) as Albania brings more and more of its high quality botanicals into the global marketplace. Fran has been stewarding his plots of horsetail and other commercial botanicals for his entire farming career. This silica-loving herb thrives under the natural irrigation of the fresh spring geysers that gush up from the very ground in which Fran plants his crops. We visited Fran, a horsetail farmer in the northern region. His land is situated in a flat valley with dappled light and fed by natural geysers bubbling up from the earth. Silica-rich horsetail thrives abundantly in this pristine wetland, and Fran has stewarded this plot by keeping it open to the sunlight and free from weed species and roaming animals. He cultivates two varieties, Equisetum arvensis and Equisetum fluviatile, each in its own sectioned pasture. Fran hand-cuts the horsetail with a scythe and allows it to air dry naturally in a covered area protected from the sun. While chatting and admiring this lush, green landscape, we are interrupted by a sudden spring bursting forth from the earth, and its crystal clear bubbles begin to flood the cultivation site. Fran knows well how fortunate he is to be able to harness these mineral springs for his irrigation. In this natural and self-sustaining system, Fran’s fields are completely submerged with this pristine water from January into March. Fran also cultivates oregano, lemon balm, dandelion, marshmallow, and eucalyptus leaf, and he enjoys wild-collecting blackberry leaf, savory, wild thyme, and linden in the fields and forests around his farm. As we approach the end of our travels here, we reflect on the intriguing and challenging contrasts we’ve observed along the way. While it would be naïve to deny the hardships suffered by these communities during past decades of oppression, the country has emerged with a landscape brimming not with the modern productivity of humans, but rather with the life-affirming productivity of nature. Those who guided us throughout our travels clearly love plants and the lives they have built around them, and many seem to be finding a comfortable rhythm between the still relatively new opportunities of reconnecting with world trade and honoring the traditional lifestyles that have long sustained them, or rather, have allowed them to sustain themselves. We look forward to returning again in the future, to see how this new/old world society continues to adapt, change, and grow—as natural things do so well. A scarecrow stands guard in a field in the shadow of the mountains. 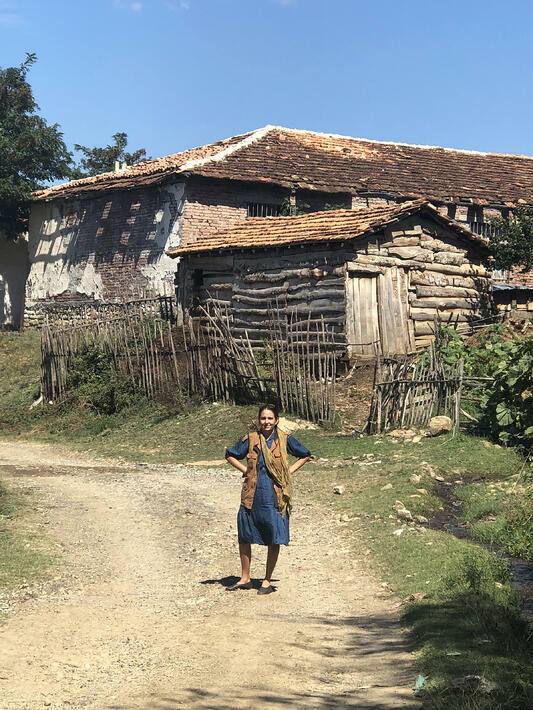 Homesteading in rural Albania is a way of life captured in time and largely untouched by modern amenities, reflecting a rich culture with strong ties to the land, the plants, and the animals the region supports. WANT The First Chapter in this Epic Journey? Jennifer Gerrity is the Chief Operations Officer at Mountain Rose Herbs and has played a key role in establishing the company's botanical sourcing program over the last decade. She has a bachelor’s degree in Plant Science at Rutgers University, where she specialized in propagation and agribusiness management. During her study there, she focused on tropical agriculture, bioremediation, and tissue culture and continued doing research for the university and the EPA after graduation. Jennifer oversees the staff, production, and quality assurance at Mountain Rose Herbs. She takes special interest in the procurement of high quality organic herbs, spices, and teas through domestic farm visits and international travel. 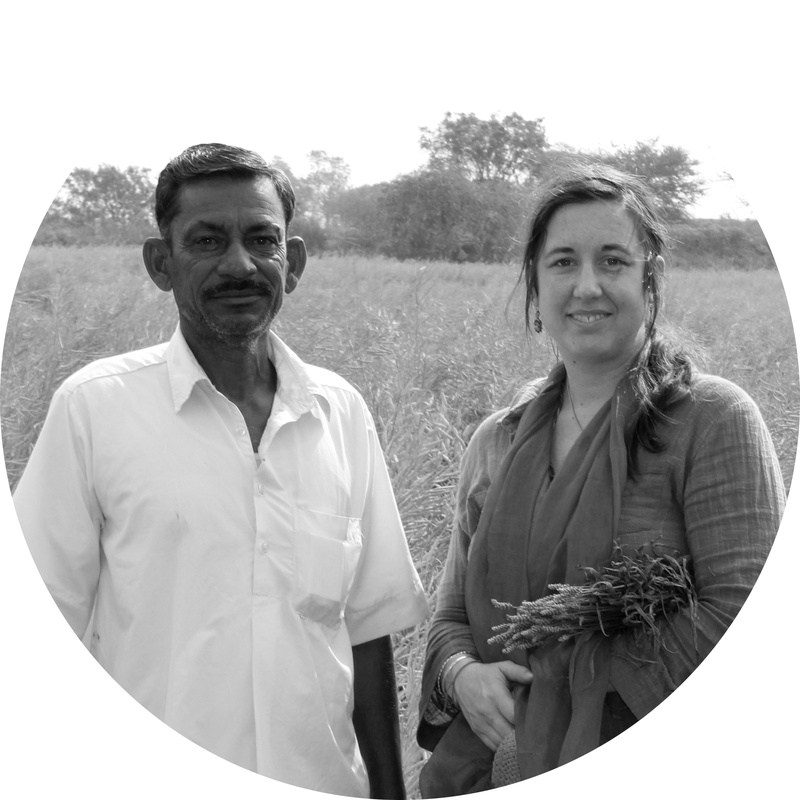 She is committed to farm development and outreach in the form of special projects such as our Fair For Life partnership in Karnataka, and cultivating a domestic market for woods grown American Ginseng.